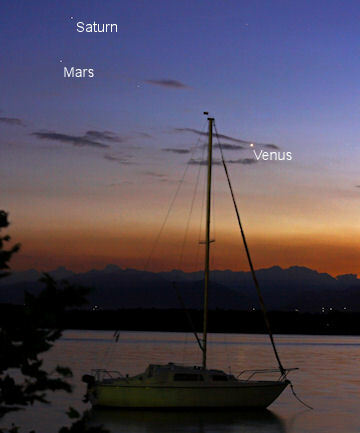 "Superbright Venus popped out of the twilight first, followed minutes later by Mars and Saturn," says De Rosa. "The sight of the lovely celestial triangle over the calm water of the lake was really great!" If a CME like this hit Earth, polar sky watchers would likely see bright auroras. In this case, however, the cloud is not aimed in our direction. At most, it would deliver a glancing blow to Earth's magnetic field around August 2nd, producing only minor geomagnetic activity. The source of the blast was apparently sunspot 1092. Future CMEs could be more geoeffective as the sunspot turns to face Earth in the days ahead. Stay tuned! On July 31, 2010 there were 1140 potentially hazardous asteroids.